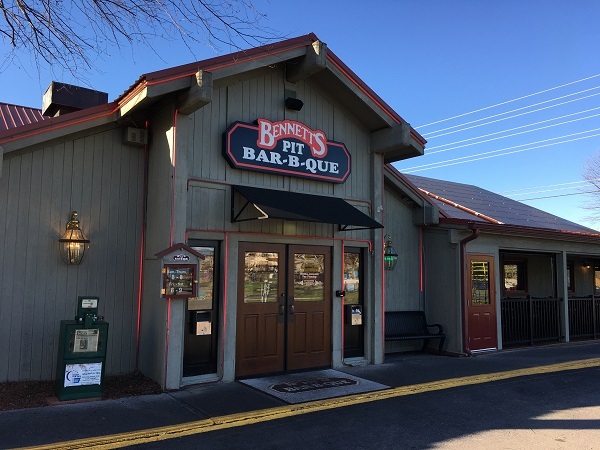 Bennett’s Pit Bar-B-Que, Pigeon Forge TN – Marie, Let's Eat! I looked for a place to try some barbecue in this tourist trap town more out of a sense of obligation than optimism, but this big barn of a restaurant proved to be a pleasant surprise. In November 2008, Marie and I accidentally drove through the Great Smoky Mountains. We wanted to drive from Atlanta to Knoxville without using the interstates, and I figured taking US-23 north through Tallulah Falls and Clayton would be a good way, and then staying on US-441 would take us there. It really didn’t register that we’d be going through the Smokies, but we sure did enjoy the drive, and we had some good pancakes in Gatlinburg. Then we got to Pigeon Forge, and experienced the gridlock traffic that town is so famous for. But there’s certainly plenty to look at, with go-kart tracks and museums and replica Titanics and giant apes, and there, on our left, was an upside-down building. We learned later that it’s a science-themed indoor amusement park for little ones, and so, eight and a half years later, we took our little one to play there. To be honest, we should have waited another year. He’s too small to ride most of the contraptions, and the hour-long line for the ropes course was a drag. But he liked parts of it a whole lot, especially the 4-D cinema “ride.” There were a few optical illusions and neat exhibits, but overall we would recommend the place for ages seven to eleven. The visit took a little longer than we had thought, but that worked out really well. We went out to find something to eat around 3.45, when all the restaurants were pretty slow. There’s an interesting little mini-chain of places run by the Johnson family which started with the first Bennett’s Pit Bar-B-Que in 1991 and has grown to incorporate four other brands (steak, southern, pizza, ice cream), each with at least two locations in Pigeon Forge, Seiverville, or Gatlinburg. To be clear, this is not a simple, small-menu situation. This is the “international house of barbecue” style, with lots and lots of choices to satisfy everybody in a group full of exhausted tourists. If there is a “Pigeon Forge style,” it’s not immediately apparent beyond an interesting sauce. So certainly, the barbecue is pretty good. I can’t imagine anybody complaining about it. It doesn’t have any wild standout flavor that demands it be added to anybody’s barbecue bucket list, but I was pleased with it. I was even more taken by the sauces, which, in a very nice surprise, are all made in-house. In squeeze bottles on the table, guests will find a standard east Tennessee sticky-sweet one, a midlands Carolina mustard, and a pink vinegar-pepper sauce. They also bring out a small decanter of another brown sauce, similar to the usual one but not as sweet, and served warm, which was the most interesting and, possibly the real tie to something truly regional. This one is said to be an old family recipe. The squeeze bottles, clearly, are not. These are all very good, but they’re provided for the comfort of people who want barbecue to taste like it does back home. The service was absolutely splendid and this was a simply satisfactory meal. Should we bring our boy back one day when he’s a little older for go-karts and giant apes, I would really want to find something off the beaten path, but if circumstances lead us back here instead, I’m sure a good little meal would be waiting. Posted on April 7, 2017 by Grant G.Posted in barbecue, knoxville, tennesseeTagged barbecue, knoxville, pigeon forge, tennessee. There used to be locations in NC, as well – – there was one briefly in Charlotte, and another in Hickory, but both are now defunct. Interesting! Could you tell us when these locations were open? I seem to recall the Hickory (actually Conover – – the two towns sort of sprawl into one another, off of I-40) location was still in business as late as 2009 or so, the Charlotte location was barely open a year around 2005? 2006? Charlotte, despite former first lady Michelle Obama’s praises, has never *really* been much of a barbecue town; even chains like Sonny’s have struggled there – – there were once 5 or 6 Sonny’s in Charlotte, now only two left. There was a chain called “Carolina Country Barbecue” that was mediocre, even if they *did* use open pits rather than smokers. All of those are gone now. 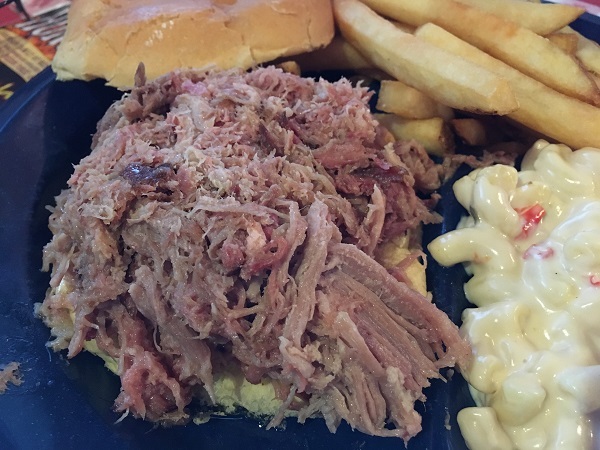 Although Charlotte currently has some good places (Midwood Smokehouse is a standout, and has become a mini-chain) the BBQ situation there is still such that Charlotte will claim restaurants as far away as Shelby (Red Bridges BBQ Lodge) when doing Best of Charlotte BBQ polls. 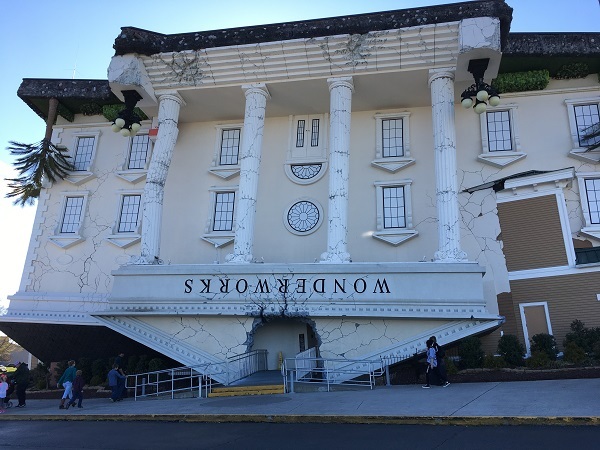 We’ve gone to Pigeon Forge every year (at least once, sometimes twice) for the past 13 years. I’ve been to Bennetts once and wasn’t really impressed, although it’s been over ten years and might be time to give them another shot. I prefer going to Corkys and getting the Memphis dry style ribs (available as an AYCE item). They also serve them “wet” but since not very many places offer the dry style, I like to get them there. They are on the main strip more towards the Gatlinburg end, same side of the road as Bennetts. Calhouns has some good ribs as well but their sauce is a little strong for my liking. I’ve been to a Corky’s that used to be outside Atlanta, many years before we started blogging. The original is still on our Memphis to-do list, but we have not made it there yet. I do enjoy dry ribs! My first experience with Corkys was at the original when I was on a business trip in Memphis. Speaking of which, Speedy from the Barbecue Bros was in Memphis on a business trip last week. Clearly I need to sell my boss on the idea of me traveling more so I can get to Memphis more often. I’m sure I can do something productive in Memphis in between eating ribs. I find it funny that you “tried BBQ out of obligation, and not optimism”… ha ha ha, thats what I always feel obligated to try the BBQ. This is a great post!